ESE Direct > Articles > Are you the keymaster? You may not be saving New York City or the world this time round, but you can definitely be sure that your keys will be in order and meticulously organised with a key cabinet. 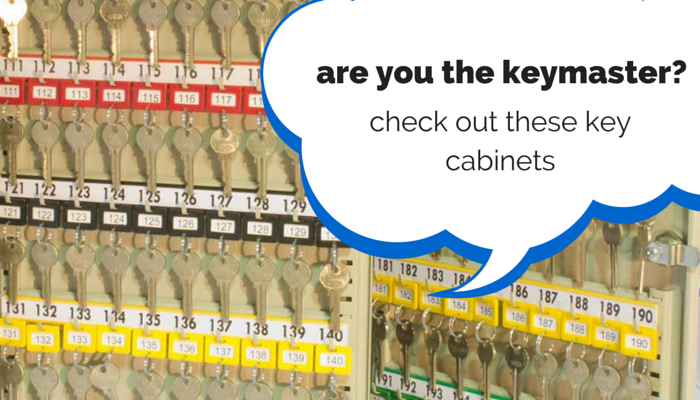 Whilst key cabinets may not be something you think about day to day, they are used by a whole range of industries and businesses alike from estate agents to car dealerships, so what are the pros and what type of key cabinets are out there? So what can a key cabinet do for you then? What types of key cabinet are available? So now you know what they can do for you, we take a quick look at the three most popular types of key cabinets available. The high security key cabinets are ideal for businesses that deal with a lot of keys at any one time, whether it is indeed a car dealership, estate agents or retail. Because these cabinets are made of 3mm steel walls and 6mm steel door, it means that it will be extremely hard wearing and the eight level bitted lock gives you peace of mind with its high levels of security. The red emergency key cabinets are pretty self-explanatory; they provide an ideal and highly visible place to store important keys either to restricted areas, or escape routes on premises. These key cabinets also come with an array of options including hammer and chain set and replacement glass. These are a definite long term investment. The slimline key cabinets are probably the most popular and ones you will see most often. A cost effective way of keeping keys organised and in one place which everyone can have access to. It features a magnetic door ensuring that it closes and is made from durable materials making it durable. The slimline key cabinets offer 72 or 96 key storage as well as matching key tags for easy identification. If you have any questions about our key cabinets please do give us a call on 03333 316 083 and our friendly customer service team will be happy to help. Tags : key cabinet key cupboard are you the keymaster?